Spazieren Sie durch The Rocks auf dieser Spukreise in Sydney. Erhalten Sie Zugriff auf das, was sich hinter verschlossenen Gassen, in engen Gassen und exklusiven Orten befindet, während Sie einem Führer gruselige Geschichten anhören. Erfahren Sie mehr über Australiens Verurteilungsgeschichte und wie dies das moderne Australien geprägt hat. This tour is part scary, historical and comical. The guide was great and very knowledgeable about Sydney history including other questions that we asked of him unrelated to the tour sites. We got mixed up with the dates and showed 1 day to late up but James was so kind to let us join the tour. We enjoyed the tour a lot and so did everyone else on this tour. We liked the fact that it was with a lot of history. We also picked a perfect night, the weather was just beautiful and it was a pleasure to walk around and listen to James stories! Our guide James did a fantastic tour and made it so much fun. We had a great night. James was filled with history and gave a view of Sydney never experienced. 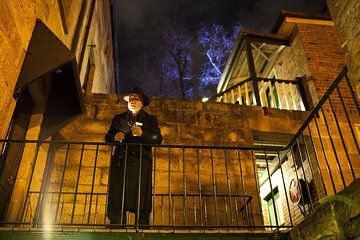 Fun walking tour around The Rocks area filled with interesting ghost stories. Guide was a creative storyteller. Saw some areas of the Rocks that we wouldn't have wandered into. Great tour if you like Ghost tours which we do. Only complaint was that the group was too large.